Once the weather starts to cool I tend to forget all about salad and focus whole heartedly on soups. So much so that hubby commented the other day, “soup again?”. The good news is that I’ve got several soup recipes to share with you, like this one for example, but since I’ve been making them for dinner in the evenings, I’ve had little time to spend photographing and recipe writing. I will get to reproducing and shooting them before the warmer months return, I promise. In the meantime, I thought I’d remind you, and frankly myself, that salads aren’t just for summer. While we generally associate salad with warmer weather, let’s not forget all the wonderful ingredients that we could put into an autumn or winter salad. Not to mention the portability, for which salads just can’t be beat, making them the perfect work lunch. They don’t need to be reheated and you don’t have to be worried about them leaking in your bag. Summer may have its berries and stone fruits, but autumn and winter have their glorious produce as well. 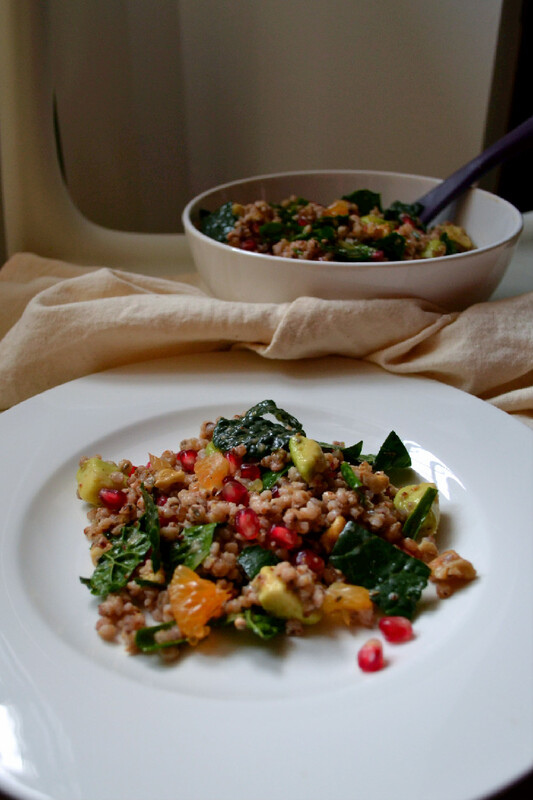 Pomegranate and clementines, and lest not forget the super hero of all veggies, Tuscan Kale. Put them together and you’ve got a match made in heaven. Add avocado, walnuts and top it all off with a tangy clementine pomegranate vinaigrette and you’ve got yourself a fine combination of ingredients. 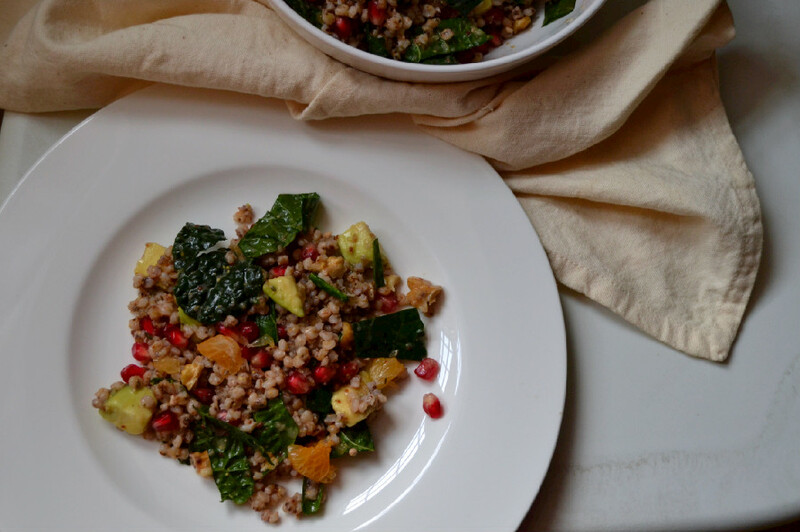 Since it is autumn after all and the weather has cooled down significantly, I wanted to add a warming element that could provide heat to the body and make this salad a meal in and of itself, so I used sorghum as the base, also known as Jowar in Indian cooking. If you’re gluten free and/or familiar with gluten free baking then you’ve more than likely heard of sorghum flour, which comes from the Soghum grain of course. It is not only naturally gluten free, but also a good source of fiber, iron, B vitamins and protein. Its pearly and resembles Israeli couscous in shape, with a slightly darker colour. The taste is very delicate which makes it a nice canvas for many flavours. Since it can be eaten whole with its outer shell intact, it’s not hulled and retains almost all of its goodness, from plant to plate. Recipes & Photography by Nissrine @ Harmony à la Carte. This main course salad is packed with the goodness of the season’s best finds. 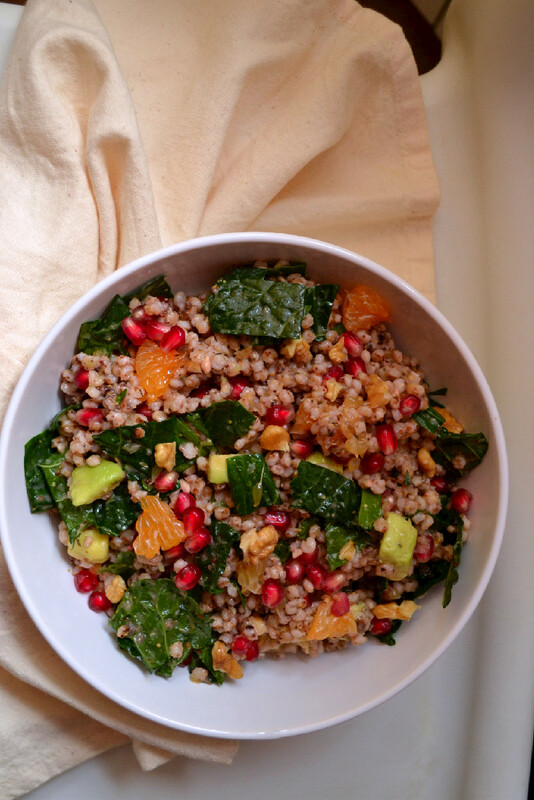 Gluten Free and protein rich Sorghum acts as a canvas for nutrient dense Tuscan Kale, pomegranates, juicy clementines, creamy avocado, radishes and walnuts and gets dressed with a Clementine-Pomegranate Vinaigrette that’s tangy and slightly sweet. Massage kale with one tablespoon of vinaigrette until the leaves soften and become tender. If you use your hands you’ll feel when they’re ready, but you could also take a bite to check. Add sorghum, pomegranate seeds, radish, walnut pieces, avocado and kale to a large mixing bowl, top with remainder of vinaigrette and toss to combine. Transfer to a serving bowl or individual serving dishes and serve at room temperature. Store left overs in a container in the refrigerator and eat cold or at room temperature. Juice clementine, add to blender or food processor with all other ingredients, and blend on high speed until well combined and a thick vinaigrette is formed. This looks amazing, beautiful and creative! I love kale very much and I also love that you put thyme in the dressing, I LOVE thyme and used it in my recent recipe. It’s such a wonderful aromatic herb. That’s too funny about your husband saying “soup again?” Haha! I’ve been cooking soup most days as well, my own hubby will probably be saying that soon as well, haha!